Kingston Secondary School, which will consolidate secondary students from Kingston Collegiate & Vocational Institute (KCVI), Queen Elizabeth Collegiate & Vocational Institute (QECVI) and relocate Grade 7 and 8 intermediate French Immersion/Extended French students from Module Vanier, is now under construction. Construction on the 171,000-square-foot facility began in November 2017 on the former QECVI property on Kirkpatrick Street. The new school will accommodate 1,340 students (240 intermediate students and 1,100 secondary students), and will include English programs in university, college and workplace pathways, including the International Baccalaureate (IB) Program, and intermediate and secondary extended French and French Immersion (Module Vanier). The building will feature 34 secondary classrooms and 9 intermediate classrooms including several special and multi-purpose spaces. The Government of Ontario has provided $38.3 million to build the new school which was designed by ZAS Architects Inc. and is being built by Bondfield Construction. 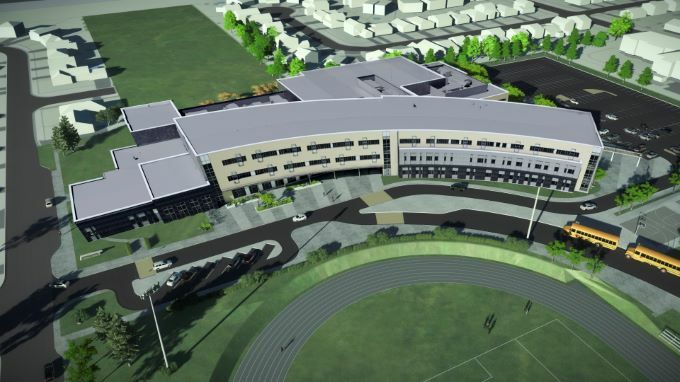 The new school is expected to be complete for the 2019-2020 school year. An Integration Committee made up of students, staff and families from the affected schools has met several times already to help facilitate various transition activities, including honouring and incorporating artifacts and other memorabilia from each of the schools. The Board of Trustees voted in June 2013 to build a new composite intermediate and secondary school following a Program & Accommodation Review of intermediate and secondary schools in the central area of Kingston.